Some of my friends and I were talking about how easy it is for us to isolate ourselves as stay-at-home moms and artists. Even though most of us are empty-nesters now it seems there's always a laundry list of things that need to get done and the day just wizzes by without having seen anyone. It gets lonely. One day in June, we found a way to end our isolation and work at the same time which is absolutely wonderful. On a day that was kind of iffy in terms of the weather (it was supposed to rain at about 1 o'clock and come down torrentially) there was some apprehension about going outdoors to do some plain air painting. But being a daring women that we are we opted to head out anyway at about 10:30 in the morning and met at a local park where there is a beautiful spring house and pond which is great fodder for outdoor painting. Not be much of a landscape artist myself, it was a challenge for me, and I have to admit not something terribly interesting to me. But I did enjoy and appreciate the company and talent of my three friends. Jeanne hails from Wallingford, Pennsylvania and is an art historian and the editor of my book, "Millicent and the Faraway Moon" She is a very talented artist in her own right. 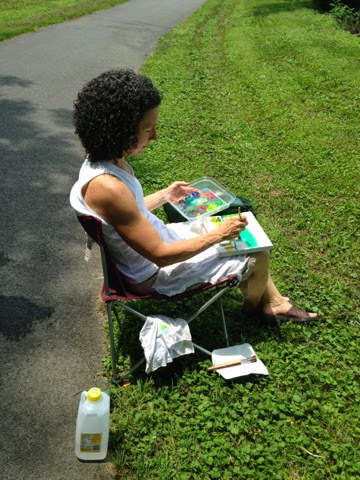 She was working on watercolors and chose a nice shady spot for herself where she managed to knock out two beautiful little paintings in the time we were there until about two at 2 PM. Mary and Kathy and I seemed to cluster in the same spot across from the springhouse. Mary and I concentrated on painting the springhouse and the pond while Kathy was painting some trees and a clearing to the right. Mary was working in acrylics. She is a fiber artist by training but also loves to paint and studied with Al Staszetsky in the past. Kathy is a tremendous oil painter. Her sense of color, painterly brushstrokes and traditional style really take my breath away. It was really because of her that we were out there yesterday both because of our isolation but because she had been told by a painting instructor that she needed to get out more and try landscape as she is primarily a trompe l'oeil and portrait painter. Me, you know what I do. As I said landscape is something that doesn't tremendously interest me to paint. I have done it on occasion because I've been inspired by a beautiful place and somehow I think miraculously I'm going to become one of those amazing landscape painters who can capture the beauty that God created. However that's not the case. Whenever I start to paint the fact that I am a humble self-taught folk artist quickly emerges. As I see my friends around me painting with reds and blues and yellows and oranges and a landscape that I mostly see as sheets of green I really end up feeling quite inept. But that's ok. As artists, we all have our moments of challenge and doubt. if we don;t allow ourselves to get too caught up in it, it will just propel us on to the next thing.